This was a simple, quick and yummy dinner. The meal is pretty self explanatory- no complicated recipes involved. This is the type of meal I tend to make when we need to eat quickly. This night my husband had to leave about an hour after I got home. So I needed to make dinner and he needed a chance to sit down and eat it, within an hour. Plenty of time. This meal is actually 100% local too. 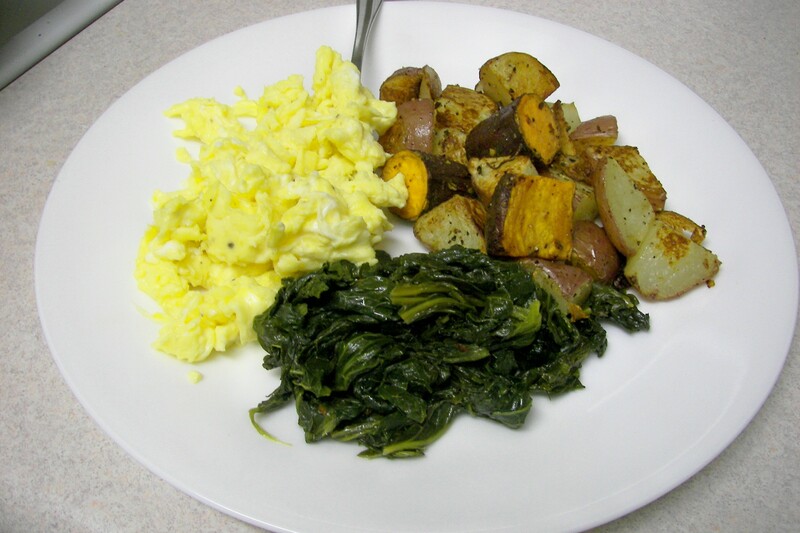 Eggs and kale from Fickle Creek Farm, and the potatoes from Jones Farm and Redbud Farm. Heat a skillet over medium heat, add some oil. Whisk the eggs, water, salt and pepper in a mixing bowl until eggs are pale yellow and slightly fluffy. Add the eggs when the skillet is hot and constantly push around until solid-take off the heat just before they are done. Heat the oven to 400 F. Toss potatoes with olive oil in roasting pan, season with salt and pepper, roast until tender- about 15 minutes. Heat oil in medium-sized pot over medium-high heat. When oil is hot add pepper flakes and garlic. When garlic starts to brown add kale and cover. Lower heat and simmer/saute about 8-10 minutes, stirring occasionally. You can add some water or broth if it gets to dry.